Posted in: women. 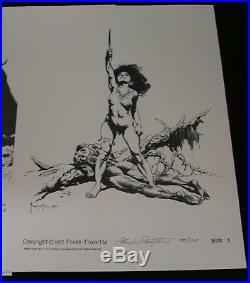 Tagged: ages, frank, frazetta, plates, portfolio, signed, women. 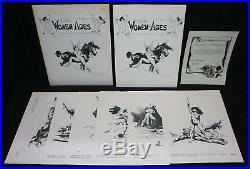 Women of the Ages Portfolio (Outside: FINEN / Plates: EX) 1977 Signed by Frank Frazetta Comes with 6 plates. One of them is signed by Frank. Size: 12″ x 15.5″. This item was uploaded by Bobby. If you have any specific questions or requests, please ask us prior to ordering and we’ll get back to you as soon as we can. If there are any problems with your order whatsoever, please message us before leaving feedback and we’ll be happy to work with you to fix the situation! The price may vary based on size, weight, and location. When are your operation hours? We are not open on weekends, so if you send us a request on Friday evening we won’t get back to you until Monday afternoon. Please don’t take it as us ignoring you! We will work on your request Monday and get back to you as soon as we can. Also, if you order from us on a Friday evening or Saturday morning we won’t start processing your order until we open on Monday. The tracking hasn’t moved. We realize you’re eager to get your item, so if the tracking hasn’t moved in a few days please don’t be concerned. There are times when the tracking won’t even show movement until it’s in your area’s regional distribution center. This is normal in our experience. Is the item pictured the exact one for sale? We don’t use stock images and go through great lengths to photograph everything we list. 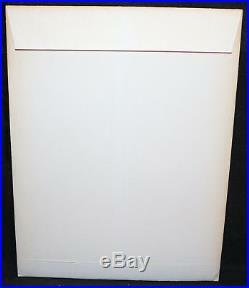 The item pictured is exactly what you should receive UNLESS it is a fixed price listing with multiple items available. How do you grade? Grading is very subjective, but we are professionals with decades of grading experience between us who try the best we can to accurately describe the condition of the items we list. Anthony is an Overstreet Comic Book Price Guide Advisor. Yes, of like items. Such as: several comics can fit in one cardboard mailer, as can more than one record. Multiple art pages can easily be combined because they are light and thin. For instance, two statues require a much bigger box. Same goes for CGCs, as the package gets bigger and heavier as you go. I’ve had some bad experiences.. You needn’t worry; we are professionals who value your business and want your item to arrive safely as much as you do. I have been collecting for over 30 years. I send out items the way I would like to receive them. This is normal for our Post Office and will not impact you receiving your item in a timely matter. What is the difference between a RUN and a LOT? A RUN will be a collection of consecutive issues with no breaks in between them. If it says RUN of #s 1 – 50 you will receive 50 consecutive comics. A LOT will be within a certain range, so a 50pc LOT will not contain consecutive books. Pictured left to right, my employees: Chris, Connelly, Bobby, & Shannon alongside my family: Sharon, Myself (Anthony), Cameron, AJ, and Jamison Snyder. AS SEEN ON TV. Anthony is always interested in doing business and answering your questions. If you are new to collecting or have something to sell, feel free to ask any questions that you may have. 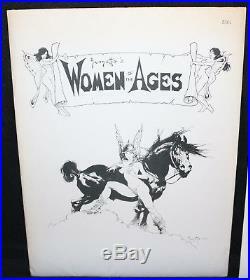 The item “Women of the Ages Portfolio (Out FN / Plates EX) 1977 Signed by Frank Frazetta” is in sale since Thursday, August 23, 2018. This item is in the category “Collectibles\Comics\Posters”. The seller is “anthonyscomicbookart-online” and is located in Moonachie, New Jersey. This item can be shipped worldwide. Posted in: women. Tagged: campbell, comics, marvel, print, scott, signed, women. 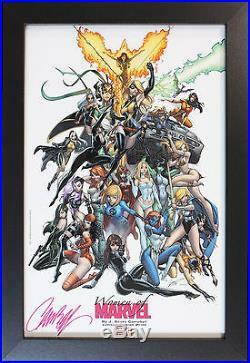 THE WOMEN OF MARVEL COMICS ART PRINT Signed by J. Scott Campbell – 11″ x 17″. This beautiful piece of art by J. This is not a reproduction or a copied piece of art! The actual art measures 11″ X 17″. The frame is obviously a little bigger. The frame is matte black (wood) and includes glass. This item also includes hanging hardware. This art print is signed by the artist, J. FOR MORE GREAT ITEMS! The free listing tool. The item “THE WOMEN OF MARVEL COMICS ART PRINT Signed by J. Scott Campbell 11 x 17″ is in sale since Sunday, December 20, 2015. This item is in the category “Collectibles\Comics\Posters”. The seller is “comicchixs” and is located in Portage, Michigan. This item can be shipped to United States, to all countries in Europe, to all countries in continental Asia, to Canada, to Mexico, to Australia.